Earn $3.69 in Rewards credit (369 points) What's This? Have this one on the rocks. Unless you're looking to get stranded in the middle of the nowhere, it'd be a wise choice to pay attention to how the larger volume, added grip, and Tubeless Easy technology come together in the Schwalbe G-One Gravel Tire to get you through the gravel trouble-free. Low profile knobs and 35+ mm width options practically turn your adventure bike into a rock-cheating cloud, and pinch flats on the rough stuff are virtually a thing of the past thanks to Schwalbe's MicroSkin Tubeless Easy tech found in the G-One's casing. It's made of a high-tensile micro fabric that's vulcanized into the carcass for an airtight seal, even at higher pressures, and it also has the benefit of adding more cut resistance all around while decreasing weight. Combine this with Schwalbe's OneStar triple-compound rubber, and you'll be carving corners and flying into loose gravel sections without a worry in the world. Available in multiple width options. Tubeless ready. 127 EPI casing. Claimed weight is 400 g (size 700c x 35 mm). The G-One is the most versatile tire I've ever used. It rolls fast on pavement. It rolls fast on dirt and gravel. It's tubeless and installed easily. I've used these for everything from commuting (25 miles one way, mixed pavement and gravel) to gravel grinding to summertime cyclocross training. They're awesome. I live in the hills. 28 are fine but 35 tubeless running at 50 to 60 psi is heaven with theses. So much grip and forgiveness. And they are fast! Not a lot of difference with 28 at max psi. Very smooth rolling tire with just the right tread for mixed terrain. Best on hard pack gravel, there are better option out there for rough gravel only riding. My only disappointment was in terms of durability and tubeless setup. Tighter and trickier to setup tubeless than other tires I have used. On my second ride I punctured in some rough gravel bad enough that it would not seal. Nice tire for racing or training rides in clean conditions... Beware for commuting, touring, any situation where your not willing to accept performance with increased hassle flat risk. The 35mm G-One is a reliable tubeless tire, which I've found to be fast rolling, on both tarmac and pavement. Zero casing cuts from gravel. Subjectively, the G-One seems faster rolling than a Challange Gravel Grinder (also a great tire), with comparable cornering traction. The G-Ones set up easily on a set of Stan's Grail rims. Two items to note first, I found that the G-One rides best with surprisingly low air pressure, so take a gauge with you on the first few rides and experiment. Also, if you mount these on a Stan's rim, the bead with stretch a bit, and they will then be almost impossible to mount on some other rims, that have a less-tight fit. Overall, a great tubeless tire for mixed-surface riding. My tires varied a bit in weight 391 and 432 grams. Typical of Schwalble, in my experience. These are great tires. They set up tubeless beautifully with Ultegra 6800 rims which makes for a great combo that makes the ride quality of my older aluminum cross bike frame very comfortable. Fast rolling and nice traction (at least in dry, haven't tried them in wet yet). Highly recommended. I have two sets of these (38cc), one on my Niner RLT and the other set on my LITESPEED T5G. My first try of tubeless tires and it's been good with not flats on either bike. Both sets are approaching 1K miles and the rear tire is pretty well worn down in the center on both. I'm a Clydesdale 6-1 and 230's and I run them at 60psi. Traction is very good even when the roads are wet. I'm going to replace both rears soon, the fronts look like they'll go a while longer. I have added sealant to both sets after the seemed to lose pressure more often. They are easy to mount and very easy to live with. A bit pricey but all around I think there is good value in them. I've had two sets of these, one 35mm and one 38mm. Both have had very early, non-sealable puncturestears when running tubeless. They are fast and have great traction, I really like the profile, but I haven't had luck with them being durable. I have had the same issue with running the G-1 road tire tubeless as well. I really like the feel of Schwalbe tires but they don't hold up for me for whatever reason. I'm sticking with Conti for road and currently WTB for gravel. I went with the 60-622 (29 x 2.35 Inch) Snakeskin model. Tubeless is awesome, until it's not. These tires have two glaring issues 1) they puncture easily. Having the juice to close the hole is nice, but it is only a patch. after a few to many punctures you pretty much need to replace the tire. This happened to me after only 4 months of riding (10-20 miles a day on Seattle side streets). 2) The front tire tracks BIG TIME if you like the pressure low. I love the ride at 18 psi, but was forced to 25 psi because steering was difficult. The front tire fights in the opposite direction of your turn. I bit the bullet and just replaced these with Big Apples, sacrificing light weight for durability. 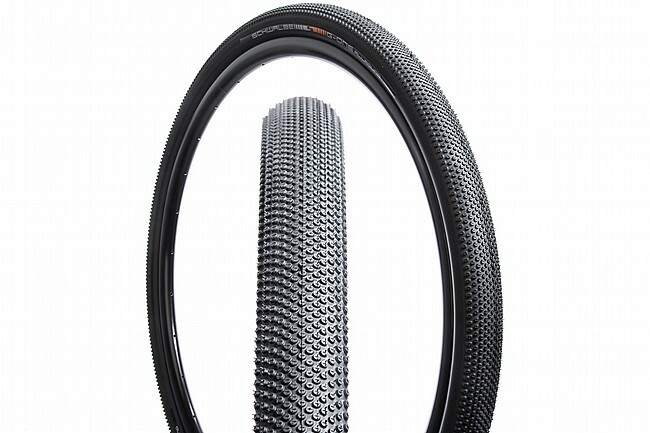 I have the Schwalbe G-One Allround 700c Tubeless Gravel Tire in 38c mounted tubeless front and rear on my gravel bike. So far I've been happy with these tires for general use. The low profile knobbies provide a smooth ride yet pretty good grip (except in mud). I don't race gravel or ride really rough terrain so I can't comment on how these tires would hold up under high stress conditions. I have used this tire for many epic races and it has performed flawlessly! 700 miles before they need replacing. 75% gravel 25% road with some sandmudgrass. I have not had a flat or burp (3rd pair so far) I usually run lower pressure than most riders. Fresh Stans every few months and I'm good to go (DT Swiss loops). Latest set up is 38 front 35 rear. I also use the X-Ones (33) for CX racing. Great on road for a gravel tire, I can average only 0.2mph average off my best on a 30mph loop with this tire, but wants for nothing off road (albeit I'm in the dry south). I bought this as my first high volume (34mm) tire for my cx bike for summer mixed riding in Nor Cal. I've done a 70 mile road ride w45 psi and trail rides with about 25 psi on super dusty rough stuff. Love the extra volume and don't mind the file tread. Afraid this tire will spoil me when cx season starts and I go back to 33s. It's mounted on a HED Belgium rim, tubeless. Tires mounted extremely easily on my Stans Iron Cross wheels I think I would of even been able to use a regular pump rather than compressor to start it off. I run them on the road at 40-45psi and they have not let me down. I do need to take them off and add sealant as the stem I used doesn't have a removable core (What on earth were Shimano thinking) so I will see how easy they are to remount then. I ride on crumbling asphalt, concrete, single track and various sized gravel on my commutes and this tire has not failed me yet. 900 miles in on a 700cX38 rear tire. Holds air well setup tubeless on Bontrager Affinity wheels. Very tight fit when I installed but that also made the bead very easy to set with a floor pump. Will probably need to replace the rear tire in the next 4-500miles as the tread is already wearing down. That is my only gripe but I do like the tire very much. Just wish it were a bit less expensive to match lower durability. I have 300 miles on these, 70% dirtgravel. After pinch flatting twice in 5 minutes in my last event I decided to switch over completely to tubeless. This is my first tubeless tire, which is replacing Clement LAS (which I generally really like, other than the flats). These are gripper than the LAS on wet dirt with light loose gravel. They will not spin on climbs where I would occasionally spin the LAS. Maybe not quite as fast on pavement. Maybe. They are stiffer than the LAS and feel like they turn in quicker, probably due to a slightly more pointed profile. Like the LAS they struggle in deeper gravel, more than the Clement MXP, the tire I've been running the lags few years when I needed something more aggressive. They set up easily with a compressor and a little soap on Stan's Grail rims. No leaks or burping so far. In the future they'll get swapped to Enve M50s for races. Yeah, they're a little pricey for a tire but it's definitely worth it. On the suggestion of a fellow rider I bought a set of these tires as an all-around tire. I've used them on asphalt, gravel, dirt, grass and mud and they far exceeded my expectations. In some soupy mud I thought for sure I would be spinning wheel but I had some fairly good grip, and that was with a good bit of air in the tires. I imagine they'd perform even better with low pressure. In the dirt they stuck really well and gave me confidence in the corners. Both gravel and asphalt showed them to be the all-rounder tires I previously mentioned. Once these wear out I won't hesitate to replace them with new ones. Tires went on relatively easy and have held air very well. I have ridden these on the road, on non-technical fine gravel where punctures are not a concern. Tire performs well on both. Rolls fast on the road given the light tread, and handles well in the gravesand. My real reason for the rating is I raced them at the Bootlegger 100. They handled some very rocky and steep descents without any problem. They took beating on the descents and provided enough grip on the turns. The gravel was chunkier than I had anticipated, and they performed very well. For some comparison, I have ridden 38mm Specialized triggers, 40mm Barlow Pass, and WTB Nanos tires recently. I would say the G-1 is a mix between the Trigger and the Compass. Not as fast or supple as the Compass, but softer and faster than the Trigger. I ran the Compass at 35psi, Nanos, G-1, and Triggers at 40-42 psi (195lbs). 4 of 11 customers found this review helpful. The reason I say this is an awful tire is that it has a nasty habit of getting punctured when you ride on anything rougher than bike path cinder. I wanted to try it because it looked fast and had the right width. Well, its fast, but paper thin. Will not seal a 2mm hole in the tread when mounted tubeless. Three people in my cycling club, including me, have tried them and each of us have had unrecoverable punctures. Now, let me say that each of us rolls on genuine, Texas marble-sized gravel made of limestone. Add to that, these are races where theres anger being applied to the pedals. Just dont. 6 of 24 customers found this review helpful. Over priced , good tire but not a great tire !